2951 sold since April 2013! 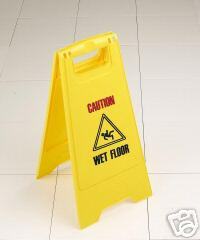 Yellow A-frame wet floor safety sign with red and black writing. Caution Wet Floor On One Side and Cleaning in Progress On Other. 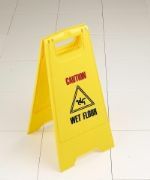 Durable warning signs for maintaining standards of health and safety obligations during cleaning for every business and public building. Janitorial warning safety signs. If you require bulk quantities please contact us for a delivery discount.